Finding the best car stereo can be quite the adventure (or chore, depending on your perspective). With so many brands and models on the market, it's hard to decipher which car deck best suits your needs and wants, as well as your budget. Whether you are looking for a simple OEM replacement or a head unit to blow your socks off (in terms of SQ and SPL, sound quality and sound production level, respectively), this guide will get you started in the right direction. User Interface: This is largely personal preference, but you do want a car deck that is easy to use. In other words, make sure that you will be comfortable with the layout of the buttons and dials, as well as the "menu" system for setting the EQ settings, etc. Aesthetics: For some people, having a flashy looking head unit is more important than a great sounding one. For others, a relatively plain -- or even, ugly -- looking deck is a-okay if the music comes out strong and clear. Again, personal preference. Pre-outs: If you plan on installing aftermarket speakers, a subwoofer (or two... or three), or an amplifier, it is important to note how many pre-outs the car deck has, and what voltage they are. Ideally, you want three 4V pre-outs if you plan on having amps for the front speakers, rear speakers, and a subwoofer. MP3 compatibility: Many car decks these days include the ability to play MP3 CDs in addition to regular audio discs. This can help reduce the number of CDs you need to carry around with you. iPod input: Alternatively, if you are already rocking everyone's favorite glossy white music player, it might be important to have a head unit that is iPod ready. Satellite radio: Sirius and XM Satellite radio are growing in popularity, and as such, most car decks will gladly exclaim that they are "XM ready", for example. Price: Ultimately, this will drive your decision the most. As with any other electronic gadget, you can get a great deal by buying last year's model. Here's a quick run down of a number of the major brands. Bear in mind that these are generalities, with new models coming out all the time and quite the range in each company's selection. The head units offered by Pioneer are among the best looking of the bunch with most of the mid-range and higher models featuring OEL (organic electroluminescent) displays. These produce 3D-like graphics to accompany the above average sound quality. While the displays themselves may not be the most attractive, the dials and buttons usually are. The interface is fairly intuitive and Alpine decks are known for incredible sound quality at a decent price point. Usually sporting some variation of the red color scheme, JVC car stereos are a mixed bunch. The lower end models may look nice, but generally the sound quality is sub-par at best. By contrast, JVC's higher end selection hold their own against the best in the business. While the Pioneer Premier line is best known for its OEL displays, the 3-dimensional graphics were first popularized by the car decks from Panasonic. Sound quality is decent, but the main appeal is the look and styling of Panasonic's head units. 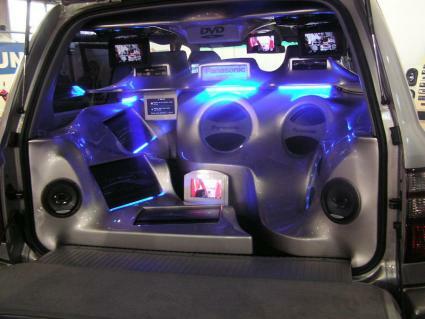 Quality has deteriorated significantly from the Sony camp since the late 1990s, especially when it comes to car audio. The Xplod line may be pretty with interchangeable faceplates and differently colored lighting, but the sound quality is not exactly up to snuff. While Kenwood may not be the most popular brand among the general public, car audio aficionados will tell you that Kenwood products should not be overlooked. The Exelon line is touted as among the best in the business given their price. I've never been a big fan of Clarion products myself, but their asking price is certainly tempting. Of course, you get what you pay for. If you need a simple, reliable deck, Clarion is a good brand to consider. Nakamichi is not exactly a household name, but this Japanese manufacturer produces some very high quality car audio products, including head units. They not be the fanciest as far as styling, but the music they produce is a treat for the ears.